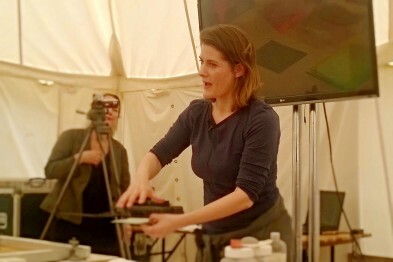 Sandwiched between a week of running workshops on my school project and a week of making the final work for the project, I had a three day show in West Dean. Had I known my timetable at the time of booking, I probably wouldn’t have attempted to do my first show in a couple of years right in the middle of a commission! So, unbelievably, it was not until the actual morning of the set up day that I even got round to thinking about my stand. But with years of experience at trade shows and selling shows and a full selection of furniture to fit stands of all sizes, it wasn’t the huge challenge that it used to be. 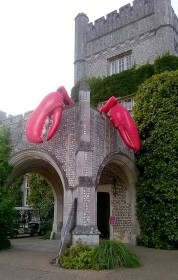 A few hours later I arrived at West Dean College where the sight of two massive lobster claws emerging from the building set the surreal celebratory tone for the weekend. 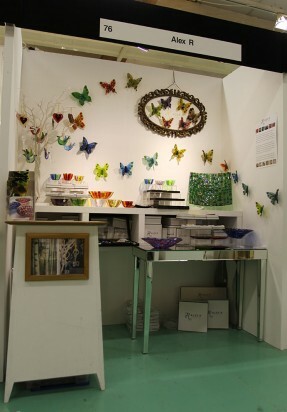 Set up was unbelievably easy, with access straight into the workshop which had been transformed into an exhibition venue. Nevertheless I was feeling a bit rusty at talking to the public about my work and I had a slow first day at the show. I was staying at the college as a paying guest and for the first time in nine years of visiting West Dean College I actually felt like a guest rather than an employee. My evenings were my own, to wander the grounds or to relax in the Oak Hall. 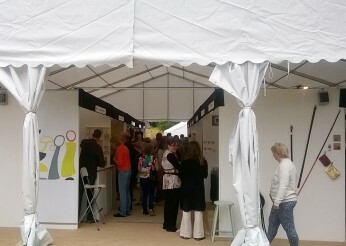 At least they would have been were I not also having to prepare for a talk and demonstration that I had been asked to give on the second morning in the Creative Hub marquee. I had a full house (or at least a full tent!) with about 60 people coming to hear my talk about “Printing Stories on Glass” and I was filmed demonstrating the making of my next product which involves a few different printing techniques. 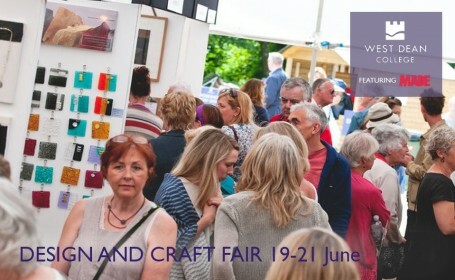 Getting back to my little stand in the exhibiting area, it was an enormous relief to only having to be talking to the one or two people that squeeze onto my stand at a time!